Print documents at up to 15% lower cost than laser, using HP Officejet inks. This original HP cartridge delivers user-friendly features including technology that lets you finish printing a critical job even when you're low on a specific ink. Count on HP Officejet ink cartridges for consistent, reliable performance. 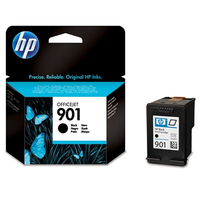 **HP 901 Black and Tri-Colour Officejet Ink Cartridges print affordable, high-quality black and colour documents using HP Officejet ink. Get reliable, professional output with laser-quality text, colour graphics and finely detailed photos. ** Ideal for home and small business customers in developed and emerging markets who want an inexpensive, simple and reliable printing solution that delivers high-quality output. Print affordable documents with laser-quality black text and high-quality colour documents and graphics. HP Officejet ink produces archival-quality output that resists fading for decades. Finish a critical print job even when one cartridge runs low on ink - printing is completed with the remaining black or colour cartridges. Just remove the consumed cartridge to finish printing the document. Enjoy user-friendly features at an affordable price, whether you print standard or higher volumes. With HP, you'll always be able to find the right cartridge to match how much and how often you print.